A guide for grade 10 quadratics, including 3 forms and more! Remember back to grade 9, when we learned about linear equations and how they make straight lines? 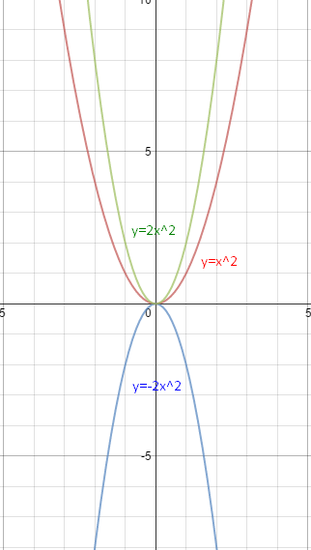 Quadratic equations make curved lines. The name quadratic is used because quad mean squared, and in a quadratic equation, the variable is squared. There are 3 forms of quadratic equations that we learn in grade 10: vertex form, factored form, and standard form. 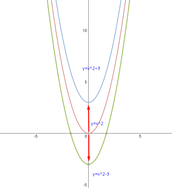 A parabola is the graph of a quadratic equation: the curved line mentioned earlier. These lines have a U-shape, and have many parts to it. A parabola can have a bunch of parts. For one, the vertex. 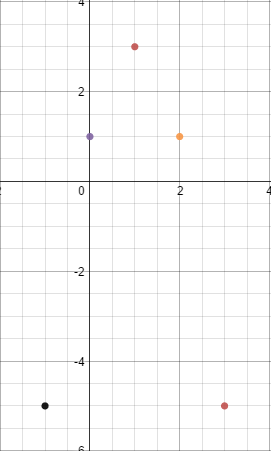 The vertex is the maximum or minimum point of the graph (depending on the graph and equation). This is also where the graph changes directions. Furthermore, the vertex is where the optimal value and the axis of symmetry cross. The minimum and maximum value is very similar to the vertex. It is the lowest or the highest point of the parabola, accordingly. This is similar to the vertex because this value is the y coordinate of the vertex. This is also called the optimal value. 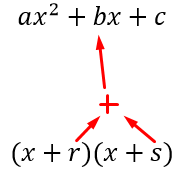 In the picture to the right, point is a minimum value, because it is the lowest point of the vertex. A parabola is symmetrical, meaning if it was split perfectly in half, both sides would be equal. The axis of symmetry would be the line that divides it perfectly in half. This is x coordinate of the vertex. This one's easy. We leaned this back in grade 9. 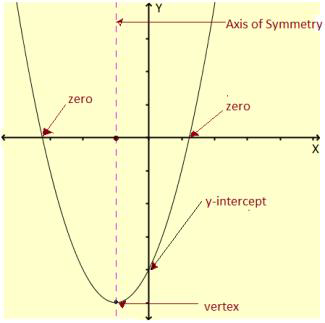 The y-intercept is where the parabola crosses the y-axis. If you know what the y-intercept is, than the x-intercept should be easy for you. 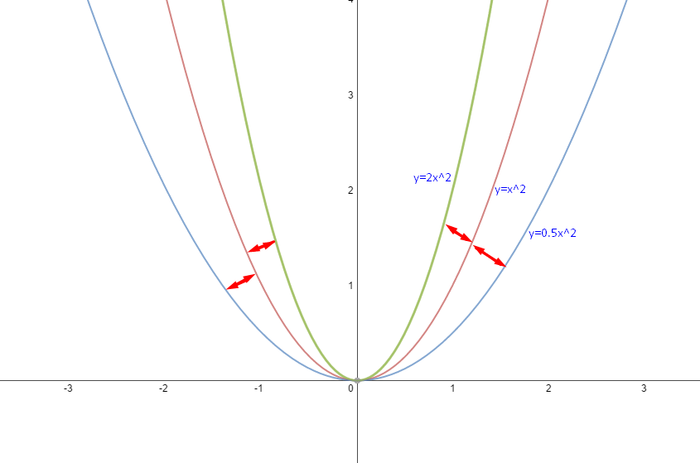 The x-intercept is where the parabola touches the x-axis. But be careful. There can be one, two, or even no x-intercepts. X-intercepts are also called zeros and roots, so don't worry if you see these words used interchangeably. A parabola can open up or down. This will be shown in a section below. The vertex is the point where the axis of symmetry and the parabola touch. This is the optimal value (minimum or maximum). In grade 9, we learned about linear relations, and now we're learning about quadratic equations. Many of you might be wondering what the difference is, so here we go! A linear equation creates a straight line, whereas a quadratic equation creates a curved line. In a quadratic equation, the variable is squared. In a linear equation, the first differences are constant. In a quadratic equation, the second differences are constant. "Wait, wait, wait! Did you just say second differences?" 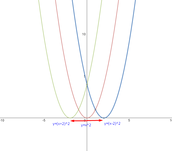 Vertex form is the first of three forms of quadratic equations that we learn. This is called vertex form because it is very easy to find the vertex. The x and y coordinates of the vertex are literally in the equation. 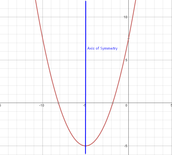 The "a" in the vertex form equation changes the vertical stretch or compression of the parabola. The higher the a value, the narrower the graph. The lower the a value, the wider the graph. 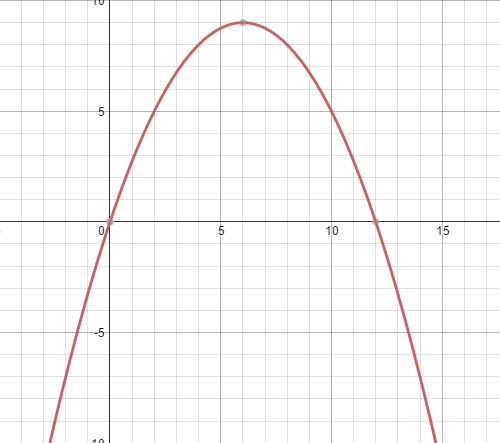 If a is greater than 0 (meaning positive), then the graph opens upwards. 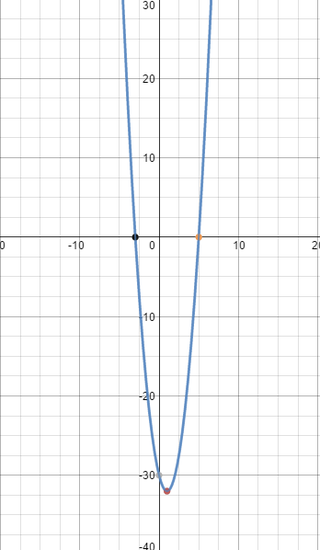 When a is positive and the parabola opens upwards, the vertex is a minimum value. 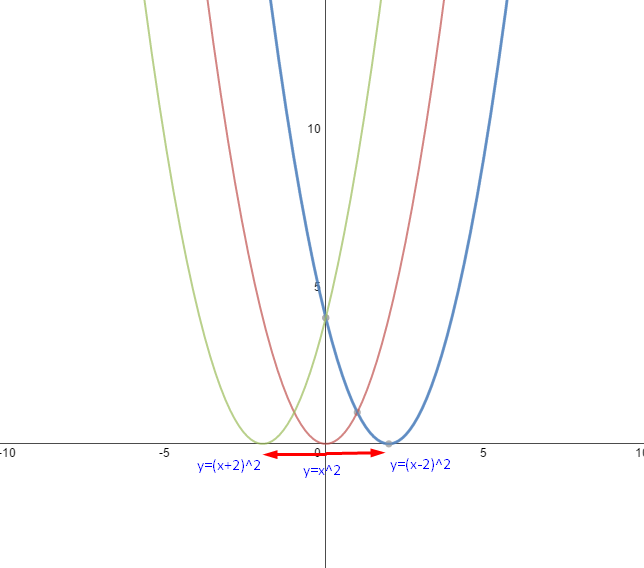 When a is negative, it is called a vertical reflection, or reflection in the x-axis. This is because the graph seems to have reflected and is now facing downwards. If a is greater than 1, then the graph is stretched. This makes the graph narrower. If a is greater than 0, but less than 1 (meaning it's a decimal/fraction), then the graph is compressed. This makes the graph wider. The h value moves the vertex left or right, and this is called a horizontal translation. The translation always starts at (0,0). The vertex is moved in the opposite way of the sign. This means that is h is negative, then the vertex will move h units right (which is the positive part of the x-axis). If h is positive, then the vertex will move h units left (which is the negative part of the x-axis). The h is also the x-coordinate of the vertex, but with the opposite sign. 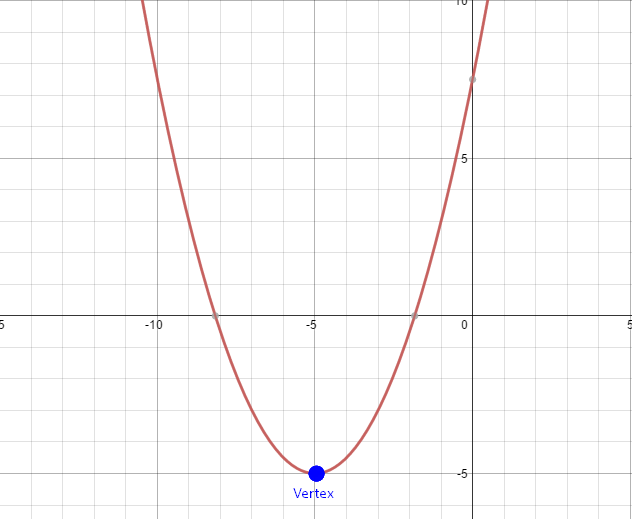 The "k" in the vertex form is used to translate the graph up or down, meaning that it moves the graph up or down. There are a few things to remember about the k value as well, but it's easier than h.
The k value moves the vertex up or down, which is called a vertical translation. Like the h value, the vertical translation should start from (0,0). You can put the horizontal and vertical translation together to find out where you must move from (0,0). If k is positive, then the graph will move k units up. If k is negative, then the graph will move k units down. The k is the y-coordinate of the vertex. So know we know that a changes the stretch/compression and/or reflection, h changes the horizontal translation, and k changes the vertical translation, we are almost at the point where we can graph. The a value is -2. We remember that a changes stretch/compression and reflection. Because a is negative, the parabola is vertically reflected. 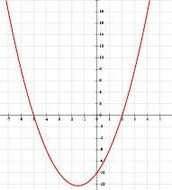 This means that the parabola opens down. Also, we can see the 2 in a. This means that the parabola is stretched by a factor of 2. Now you might be wondering what stretched is, and how we use it. That will be explained later, when we learn to graph the vertex form. We remember that h is responsible for the horizontal translation. We also remember that the vertex will translate the opposite direction of the sign. You can see that the h is negative. This means that it will translate to the right, and it will translate by 1 unit. After that, we can look at the k.
The k is used to translate the graph vertically. This will move the graph up or down. Remember, unlike the h, the k moves in the same direction of the sign. Because the k is +3, the graph will move 3 units up. Finally, we know what will happen to our graph. It is reflected vertically, stretched by a factor of 2, translated 1 unit right, and translated 3 units up. Notice the last two points: translated 1 unit right, and translated 3 units up. Earlier, when describing h and k, we said that the translation would start at (0,0). 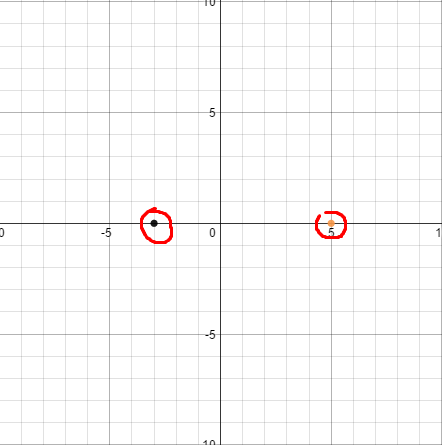 If it moves 1 to the right (x-axis), and 3 up (y-axis), what would the coordinates of the vertex be in (x,y)? The vertex would be (1,3). This is why this form is called vertex form, because the vertex is written in the equation. 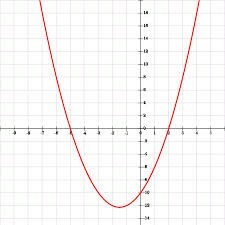 Look at y=-2(x-1)^2+3. 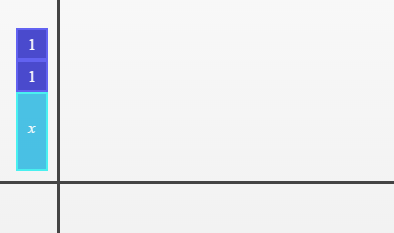 See -1? 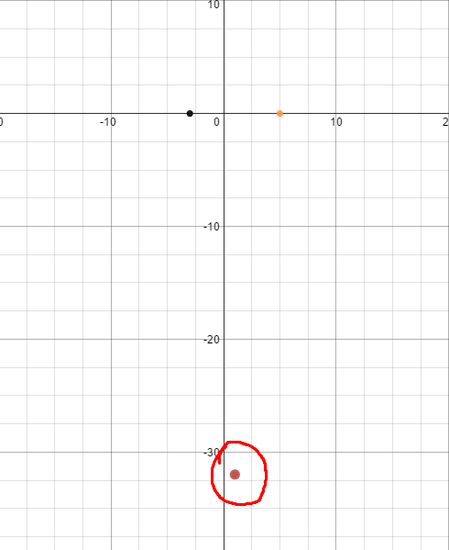 That's the 1 of the vertex (x-axis). Remember, the sign is opposite. See +3? That's the 3 of the vertex (y-axis). 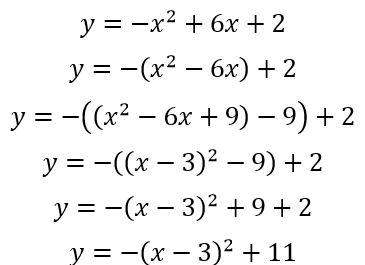 Write the properties for the following parabolas based on the equations. 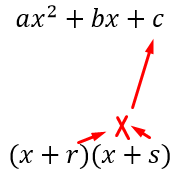 Include stretch/compression, whether or not it is reflected in the x-axis, the vertex along with the translations it went through to get there, and if the vertex is a minimum or maximum point. Remember earlier we said that in a quadratic equation, the variable is squared. This is where that can be important. The step pattern is used to help graph using vertex form. 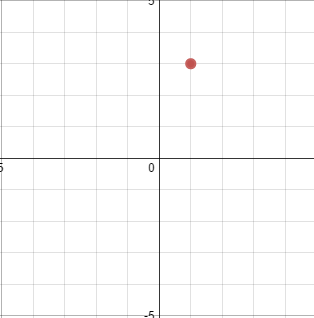 It is used to find the points of a graph. As you can see, when x is 1, y is 1. But when x is 2, y is 4, and when x is 3, y is 9. What do you notice? The y is x^2, x squared. This is what is meant by the variable is squared. The y is equal to x times x. So if x is 4, the y is 16. This is a step pattern. The step pattern is a way to describe what the y is when the x is a certain number, and in this case: 1 and 2. Remember, the step pattern for this parabola is "Over 1, Up 1. Over 2, Up 4". You begin the step pattern at the vertex. You can use this step pattern moving both left and right of the vertex, because a parabola is symmetrical from the axis of symmetry. This means that you can go left 1, up 1, left 2, up 4 AND right 1, up 1, right 2, up 4. 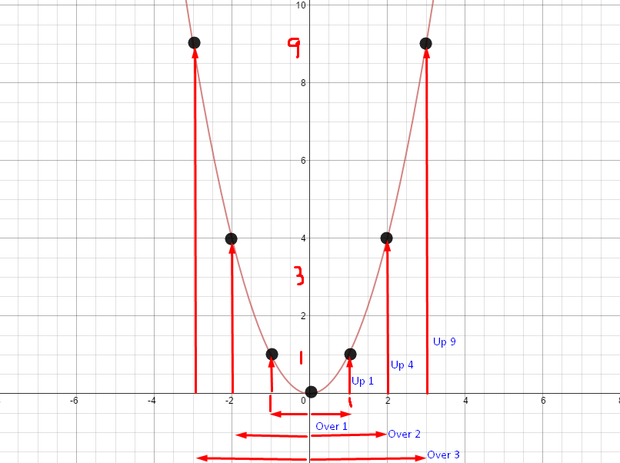 You use the step pattern to plot points on your graph so you can sketch the parabola. Now you might be wondering "Okay, so I know how to graph y=x^2. Just start at (0,0), and go over 1, up 1, over 2, up 4. But how would I graph something like y=-2(x-1)^2+3?" The step pattern will change as the a value changes. When the graph is stretched or compressed, the steps will increase or decrease, accordingly. Also, if a is negative, then the step pattern will be "Over, Down. Over, Down" instead of up. Over 1, up 1a. Over 2, up 4a. Using this, the new pattern would be: Over 1, down 2. Over 2, down 8. Do you notice how this changes? When the a value changes, the step pattern changes. To recap, just multiply the y value by the a value, and you found the new step pattern. So now we have the vertex (because of the translations), the direction of opening (reflection), and the step pattern. we are ready to graph! 1. Notice the stretch and the direction of opening. In this equation, the vertical stretch is by a factor of 2. Also, the direction of opening is down because it is negative. 2. Find and plot the vertex. We have already found the vertex for this equation. By looking at the equation, we know that the vertex is (1,3). We can plot this point on the graph. 3. Find points on the graph. You can do this by finding the step pattern of the graph. Remember, to find the step pattern by an equation, multiply the original step pattern by the a value. It is Over 1, up 1a, Over 2, up 4a. The new step pattern for this equation is "Over 1, down 2, Over 2, down 8". Begin at the vertex that you plotted, and use the step pattern to find 2 points on both the right and left of the vertex. This means go left 1, down 2, left 2, down 8. Also go right 1, down 2, right 2, down 8. So a point on my graph would be (2,1). However, you should probably use the step pattern, as it is faster and you wont need to do the equation to find every point. 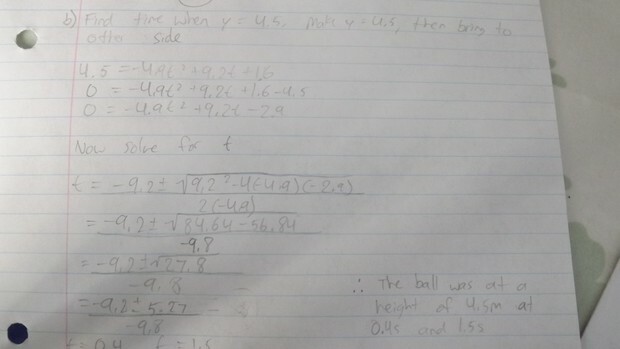 A soccer ball is kicked into the air, and follows the path of h=-0.25(t-6)^2+9. h represents height and t represents time. 2. For how long was the ball in the air? 3. What was the highest point the ball reached, in meters? 4. At how many seconds did the ball reach this height? Because this is a practice problem, we will solve this for you, so you can take this as an example. 2. For how long was the ball in the air. For this question, we can look at the 2 x-intercepts. The first one on the left would represent where the ball was kick. From there to the other x-intercept would be the time that the ball was in the air. The ball was in the air for 12 seconds. 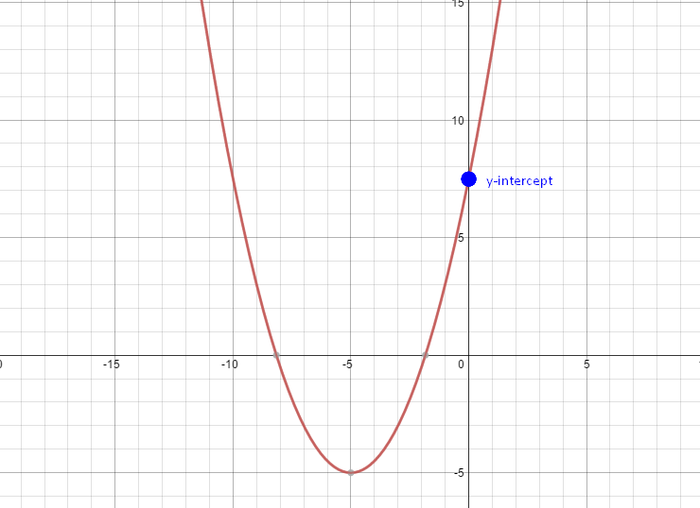 Now we need to look at the vertex, as it is the maximum point in this graph. We can look for the y-coordinate of the vertex, and that will be our highest point. The highest the ball reached was 9 meters. 4. At how many seconds did the ball reach this point? For this, we can look at the x-coordinate of the vertex. The ball reached 9 meters at 6 seconds. Let's say the vertex is (-2,8), and the parabola passes through the point (2,0). Remember how we found the vertex by looking at h and k? Also, remember how it was mentioned that the vertex was actually in the equation and that's why the form was called vertex form. Well, if you're given the vertex in a question, you already have 2 variables: h and k.
h is the x-coordinate of the vertex, but with the opposite sign. In this case, it would be 2. At this point, the only variable left is a, meaning that we can solve for a by isolating it. 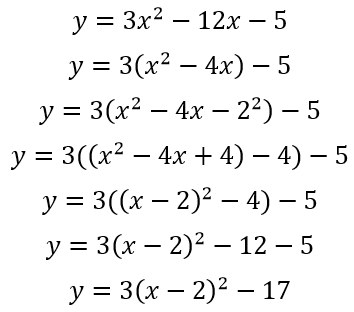 Remember, when you're solving one of these questions, first, put the h and k values into the equation, then substitute x and y to solve for an a value, and finally, but a into the equation to finish the equation. "Find the equation for a parabola that was a vertex of (2,6) and passes through the point (5,3)." In this equation, the 2 x-intercepts are 5 and -3. Remember the signs are opposite. You can also get the a value from factored form, at the beginning of the equation. Once again, the a value represents the stretch. However, the a value is not needed for graphing. You can still use it to make sketching the graph easier, or to check your graph by using the step pattern to see if you sketched it correctly. We can use the example above. We already know that the x-intercepts are 5 and -3. So we will add the 5 and -3, then divide it by 2. Now, we know that our axis of symmetry is 1. This is also the x-coordinate of the vertex. All that is left is to find the y-coordinate of the vertex. 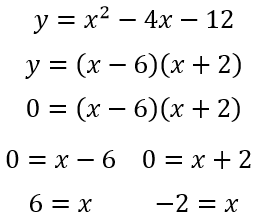 Now that there is only 1 variable left, we can just substitute the x-coordinate into the equation to find y. At this point, we also have the y-coordinate of the vertex, or the optimal value. We can put the x-coordinate and the y-coordinate together to get the vertex. The x-coordinate is 1, and the y-coordinate is -32. 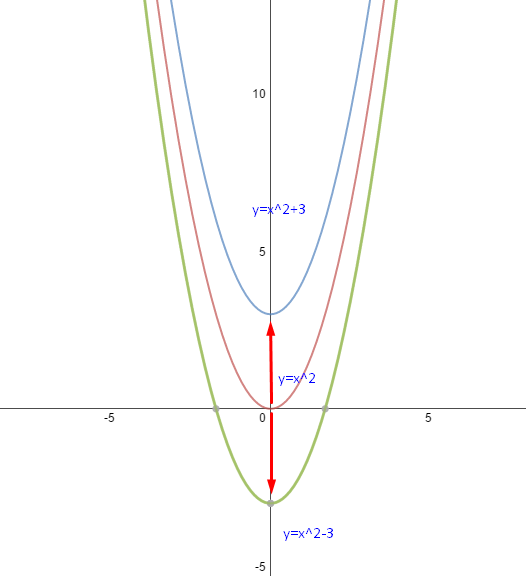 The vertex of the parabola is (1,-32). We have the vertex, and the 2 x-intercepts, meaning we're reading to graph! It is really simple now that we have our vertex and x-intercepts. Here are the steps. 1. Plot the x-intercepts. We will put points at (5,0) and (-3,0). Remember, for x-intercepts, the y-value is 0. 3. Finally, sketch in the parabola. Connect the vertex to each of the x-intercepts, making u-shape. ...and we're done. 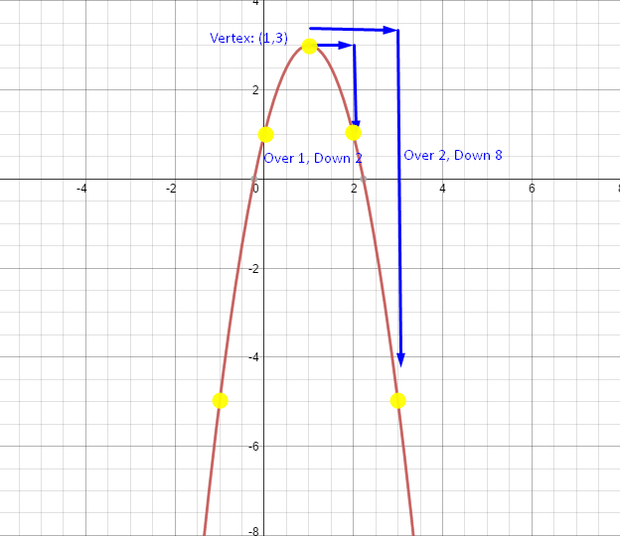 If you want, you can also check the parabola with the step pattern, as mentioned in vertex form. In this case, the parabola is "over 1, up 2, over 2, up 8." To graph standard form, we will need to factor it. Factoring is finding that is multiplied together to make the expression. If we were to factor standard form, we would get an expression in factored form, which we can then use to graph (because we learned how to do that above). 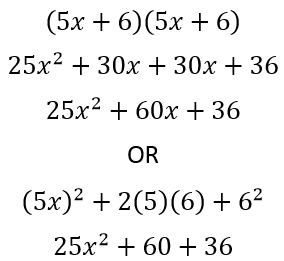 Factoring will be taught below, after multiplying binomials. However, here is an example of graphing standard form. Keep in mind what is happening so that you will understand how to graph. 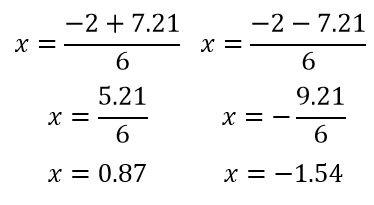 In this example, an equation in factored form turns into an equation into standard form. Multiplying binomials is how to convert factored form to standard form. If you're wondering how to convert standard form to factored form, that is done by factoring, which is further down on this site. 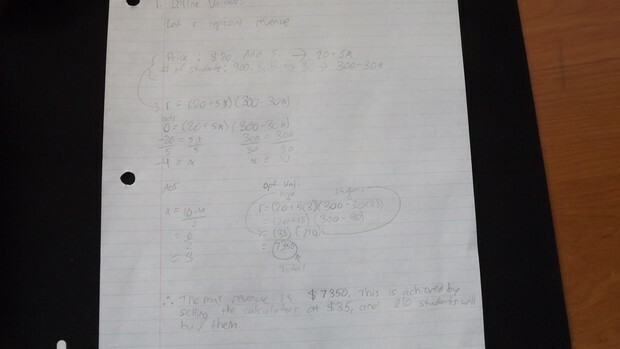 This special case is multiplying a sum and difference binomial, as shown below. When 1 is multiplied by 1, we get a 1 in the middle. When 1 is multiplied by x, we get an x in the middle. This is because 1 times x is x. When x is multiplied by x, we get x^2 in the middle. This is because x times x is x squared. With algebra tiles, you always the the middle to be a full rectangle. This means that the sides don't have missing tiles. Let's try an example. First, let's put the (x+2) on the side. Next, let's put the (x-5) on the bottom. Finally, we want to multiply the side by the bottom, and fill in the middle. What is a number in the expression above that is a factor of all the terms (can be divided by everything). The common factor would be 2. So now, we want to divide everything by 2. Finally, we want to place the common factor outside by using brackets. This way, it is the factor times what is inside the brackets. The reason why we want to do this is because now, both this expression and the original example are equal to the same thing. With common factoring, we should be able to use the distributive property and multiply, and the end result should be what we started with. This is a method to check our answer. 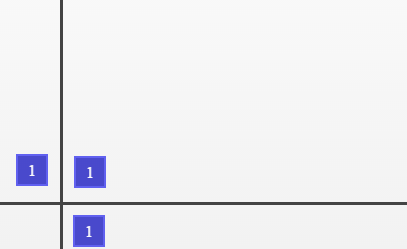 In this example, there isn't the same number in all the terms. This means that we will need to find something common in all of them. In this case, 3 is the highest common factor. We can divide everything by 3. Finally, we can close the brackets and multiply it all by the common factor: 3. As you can see, there is not a common factor that can be divided by all four terms. However, there are common factors if we split this up. We are now working with two different common factors. The common factors are much more clear now. At this point, we can use what we learned from the "Common factoring" section above. We will need to get this to the point where the factor is outside of the bracket. Now that we have factored each group, what do you notice. Look at what is inside the brackets. Both brackets have the same thing: x + y. This means that we can factor this expression further. We can divide each group by (x+y). The x+y multiplication and division will cancel each other out, and we will have m+2 remaining. However, we will need to put the m+2 in brackets, and the factor (x+y) outside of it. This is the end result, and the expression can not be factored any further. If we were to multiply the (x+y) and (m+2), we would get what we had at the start: mx + my + 2x + 2y. The b value of standard form is equal to r + s of factored form. The c value of standard form is equal to r x s of factored form. This means that to factor a simple trinomial, we need to find the factors of c, but there is a catch: we need 2 numbers that have a product of c but a sum of b. In other words, the numbers need to add to b and multiply to c.
To do this, we need to find factors of c, and whichever pair equals to b is the factors we are looking for. Lets look back at our example. In this chart, you can write the factors of c, 2 in this case, in the first column. Next, you will multiply them to ensure that they equal c. Finally, you will add them to check if they equal b. If they equal b, these are the factors you are looking for. If they do not equal b, you can check the next factors of c.
So now we have the numbers that have a product of 2 and a sum of 3. We can finally fully factor. 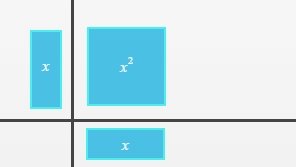 Since we already know that the factors of x^2 are x and x, we can place those. Next, we just need to add the factors to the expression. One factor will be in the first bracket, and the other will be in the second bracket. Here, we need numbers that when multiplied equal 4, and when added equal -5. We know that both the numbers must be negative, because the b is negative and the c is positive. If we remember integers, negative times negative equals positive. So let's use the chart to find our factors. Notice the sum of 1 and 4. It is 5. If you notice that you find the answer, but with the wrong sign, you can flip the sign of your factors to make the sum negative. First look for common factors, and remove them. If possible, turn the complex trinomial into a simple trinomial by factoring the a value from the trinomial. 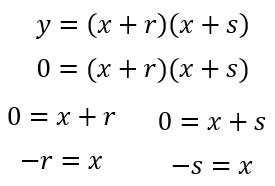 If you can do this, then factor it like a simple trinomial. Write the factors of the first and last term. In a simple trinomial, you only need the factors of the 3rd term, because the factors of the first term were always x and x. However, in a complex trinomial, the a value is not 1, so you must find the factors. Once again, you will need specific factors. Each of the factors of the first term must multiply with one of the factors of the third term. Then, when you add it all up, it should equal the middle term. Let's try an example. 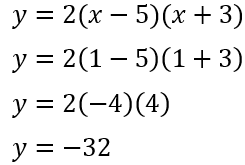 For the example at the beginning, we can make it into a simple trinomial by factoring the 3. We can use this chart. We will need to put the factors in each box, and then cross multiply. Once we have that, we will add it to find the total. The total must equal bx, or -15x in this case. If it does not equal that, then we will need to try again but with different factors. As you can see, the total did not equal -15x. So we must try again with different factors. This time, the total did equal -15x. This means that we have our factors. All that's left is to put it into factored form. We can just take one row and put it together, as shown below. Now, the name is difference of squares. Sure, the x is squared, but is that it? Nope. 100 is also a square. It is the square of 10. So in the difference of squares, we have a square subtract a square. Remember, the 100 is also a square. What do you notice? This expression follows the the a squares subtract b squared expression. In this case, x is a and 100 is b. 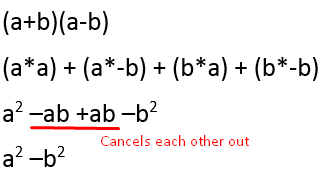 This must mean that it is also equal to (a+b)(a-b). If we want to factor this expression, we must get it back to (a+b)(a-b). 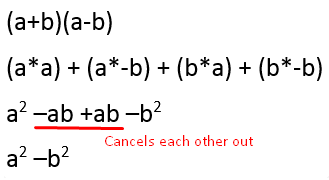 Another reason why this equation must be (a+b)(a-b) is because there are 2 squares, and the sign is negative. A sign becomes negative when it is positive and negative, meaning that one must be positive and the other must be negative. In order to find a and b, we must find the square root of both of these. Now that we know our a and b, we can fill it into (a+b)(a-b). And we have our factors. We can check this by expanding and simplifying it. This means a is 5x and b is 8. We can fill this into (a+b)(a-b). This is a perfect square trinomial. Both a and b are squared. We will now see how to factor this. You might be thinking, "Hey! That doesn't look like anything above!" Well actually, it is. Remember in the difference of squares, the numbers were already squared? That is what's going on here. the 25 and 36 are already squared. So let's find the square roots. Not it is starting to look like the algebraic expression, right? All that's left is to find the middle. 22x has to be equal to 2ab. We already know that a is 5 and b is 6. If we do 2(5)(6), we get 60. This just confirms that the equations are equal. We can check it over by expanding it or using the perfect square expression. 1. Make the standard form equation look similar to vertex form. 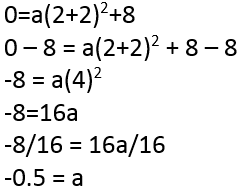 This can be done by factoring our the a value and separating the c to make it look like k from vertex form. 2. Expand what's in the brackets to make it a perfect square trinomial. You will need to add and subtract the c from the perfect square trinomial. 3. 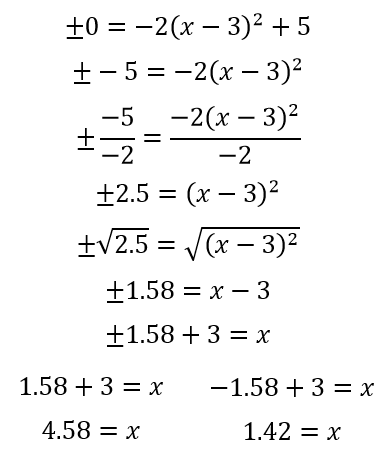 Factor the perfect square trinomial. 4. 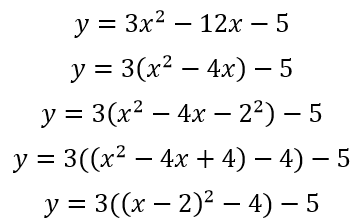 Apply the distributive property from a. Step 1: Make it look similar to standard form. In this step, we will factor our the a value, and separate the c by brackets. Step 2: Make a perfect square trinomial. In this step, we need to turn what is in the middle into a perfect square trinomial. To do so, we need a c value. In order to get the c value we need for a perfect square trinomial, divide the b value by 2. (This is because in a perfect square trinomial, the middle value equals to 2ab from the binomial.) In this case, -4 divided by 2 is -2. -2^2 is our c value, because a perfect square trinomial is a^2 + 2ab + b^2. We will need to add the c value, and then subtract it. This is because we cannot just add a number into the equation, as that changes the equation completely. However, + c - c = 0, so we can do that. In the final part of this step, the perfect square trinomial is in a bracket in a bracket. This is only to help organize, and is not necessary. Everything inside the bracket will be multiplied by the distributive property of 3 soon, however, putting the perfect square trinomial in a bracket just helps you see what will be factored. Step 3: Factor the perfect square trinomial. Now we will factor the perfect square trinomial. We need to find the square roots of x^2 and 4, which is x and 2. However, the b term is negative, meaning that the 2 is negative. Our factored form of the perfect square trinomial is (x-2)^. We can keep this inside of the bracket, as it will still be multiplied by 3. The -4 (which was used to counter the +4 from the perfect square trinomial) will remain inside the bracket, and wasn't factored because it wasn't a part of the perfect square trinomial. It will also be multiplied by the 3. 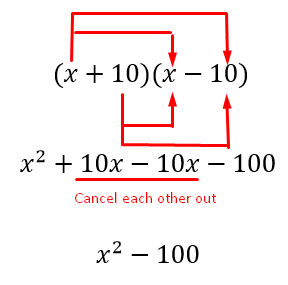 Step 4: Apply the distributive property. Next, we will multiply everything that is inside of the bracket by the a value, which is 3. The (x-2)^2 will be multiplied by the 3, and the -4 will be multiplied by the 3 as well. Step 5: Add like terms. Finally, we can finish this by adding like terms. We must the number we left outside of the bracket to the number that was multiplied by the a value. In this case, the number outside was -5, and the number we got after multiplying by 3 was -12. And now, the equation is in standard form. The a is 3, the h is -2, and the k is -17. Let's try another example. 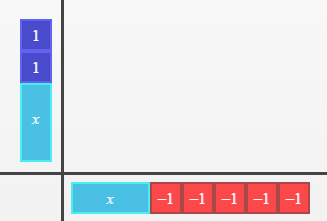 This example will have a negative a value, so we will need to factor out -1 from everything inside the brackets. Solving a quadratic equation means getting the roots/x-intercepts. When you are solving a quadratic equation, you are solving for x when y is 0. 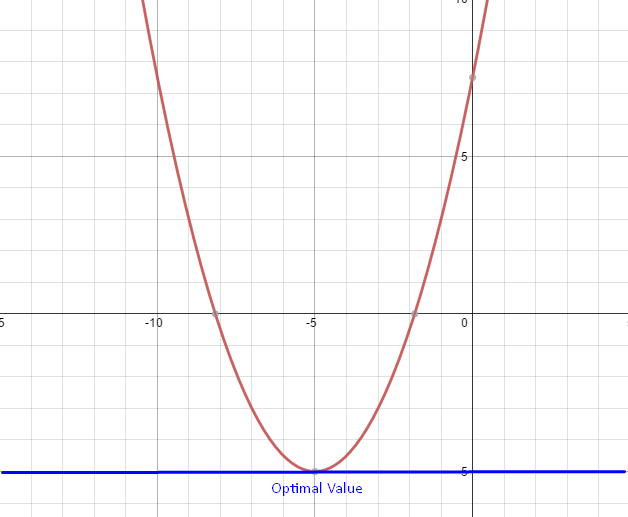 By solving a quadratic equation, we can find the axis of symmetry, optimal value, and all together, the vertex. This will allow us to graph our equation. 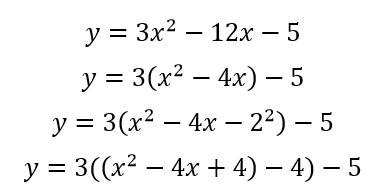 One way to solve quadratic equation is to factor. To use this method, we must get the equation into factored form. If it is in standard form, factor it. The roots are 6 and -2. This is the solution of the quadratic equation. 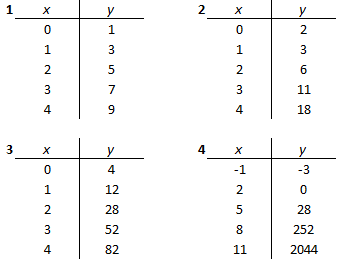 As you can see, the only other steps were to divide the coefficient to isolate x. 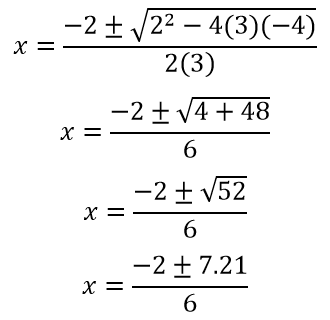 The solutions to this quadratic equation were -4 and 4. The a from standard form will replace the a in the formula. The same thing with the b and c.
Also, look back at the formula. There is a plus and minus sign together. This means that the formula can be used twice: one with a plus in that spot and one with a minus in that spot. Since the formula can be used twice, each time will give a different root, for a total of 2 roots. We will put the values of a, b, and c into the quadratic formula so that we can solve the 2 roots. Now, we've reached the plus-minus sign. There are 2 possible ways to go from here. The first is to do the equation with the plus. That will give us 1 root. The other is to do the equation with a minus. That will give us the other root. We must do both ways. These are the two roots: 0.87 and -1.54. That is the solution to the quadratic equation. There is one more thing to bring to attention. Look back to the work for the solution. There is a square root in there. 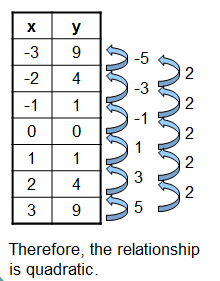 The number that is being square rooted is called a discriminant. In this quadratic equation, the discriminant was 52. The discriminant can help us know how many roots there will be. If the discriminant is positive, there will be 2 roots. This is because the number will be squared, and either added to or subtracted from the number before it. If the discriminant is negative, there will be no roots. This is because a negative number cannot be square rooted, as a square is a number times itself. To get a negative sign, the signs multiplied must be opposite, so you cannot square root a negative following this concept. If the discriminant is zero, there will be 1 root. This is because the square root of 0 is 0, so nothing will be added or subtracted to the number before it, and it will just be the number -b divided by 2(a). We will start isolating the x. As you can see, the plus-minus sign is on the other side than the x. This can give us 2 roots: 1 when the sign is positive, and the other when the sign is negative. If a is positive, and k is positive, there will be 0 roots. If a is positive and k is negative, there will be 2 roots. If a is negative and k is positive, there will be 2 roots. If a is negative and k is negative, there will be 0 roots. If k is zero, there will be 1 root regardless of what the a is. Expanding binomials will help you get from factored and vertex form to standard form. Completing the square will get you from standard form to vertex form. 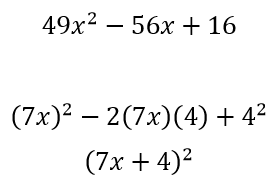 This also requires factoring (perfect square trinomials). 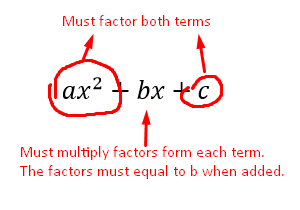 Factoring will also help you get from standard form to factored form. Factoring relates to graphing because it can help us get roots. 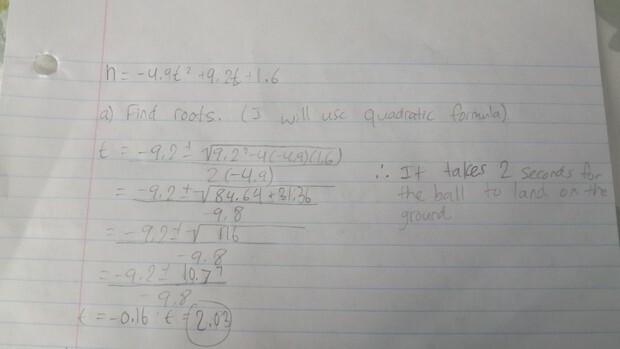 We can use quadratic formula from standard form to get roots. 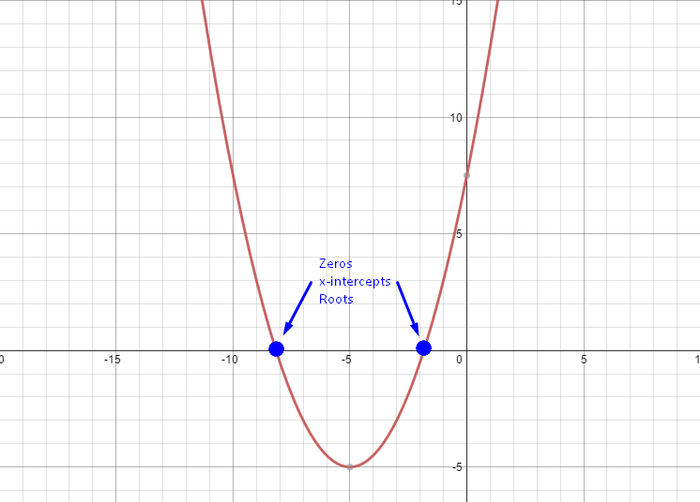 Roots can help us get the vertex, and graph the parabola. Vertex form relates to graphing because it shows us the vertex and translations, and also the step pattern. Learning about discriminants will help us know how many roots there are. Algebra tiles can help with multiplying binomials and factoring. We can go over some practice word problems. We will do a few that will display how word problems that are included in quadratics can look like. a) How long does it take for the tennis ball to fall to the ground, rounded to the nearest tenth of a second? b) Find the times when the tennis ball is at a height of 4.5 m above the ground. Round your answers to the nearest tenth of a second. c) What is the maximum height of the tennis ball? At what time does it reach this height? Round your answers to the nearest tenth. For a), we need to find the roots. For b), we need to find the roots when y=4.5. For c), we need to find the vertex. 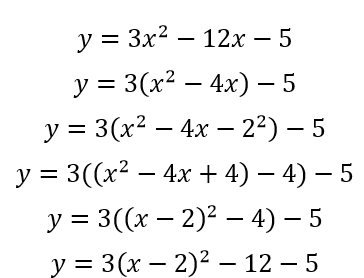 We can answer these questions using the quadratic formula. Calculators are sold to students for 20 dollars each. 300 students are willing to buy them at that price. For every 5 dollar increase in price, there are 30 fewer students willing to buy the calculator. What selling price will produce the maximum revenue and what will the maximum revenue be? We will first need to define our variables. Next, we will need to make our equation. We can use factored form for this. Then, we must find our roots and vertex. 1. The width of a rectangle is 12 metres less than the length. The area of the rectangle is 320 square metres. 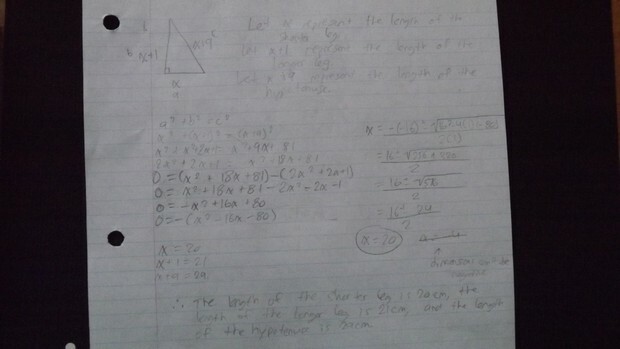 a) Write an equation that can be used to find the length and width of the rectangle. b) What are the dimensions of the rectangle? First, define your variables. Next, create an equation (remember, area = l*w.) Then, solve for your variables. Here's an important tip: dimensions cannot be negative. This narrows your roots to only one. Also, drawing a diagram can help. The product of two consecutive numbers is 1482. What are the two numbers? First, define your variables. Next, create an equation. After this, you can solve the quadratic equation. One leg of a right triangle is 1 cm longer than the other leg. The length of the hypotenuse is 9 cm greater than that of the shorter leg. Find the lengths of the three sides. You have a 500-foot roll of fencing and a large field. You want to construct a rectangular playground area. One side will not need fencing because it is a wall of a building. What are the dimensions of the largest such yard? What is the largest area? First, define variables and create an equation. 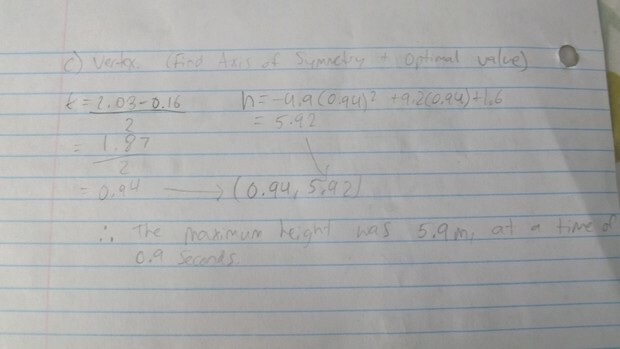 Next, you must find roots, axis of symmetry and the optimal value. Also, a diagram might help. I believe that quadratics was an interesting unit. It was different than what we did in grade 9 - linear systems. 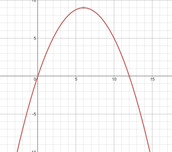 Quadratics included lines that curved, called parabolas, due to a squared variable. Quadratics is a bit more challenging than linear systems, as there was also a lot more to cover in a shorter amount of time. In this unit, we learned the 3 types of quadratic equations, multiplying binomials, factoring, algebra tiles, how to change between the 3 equations, word problems and more. 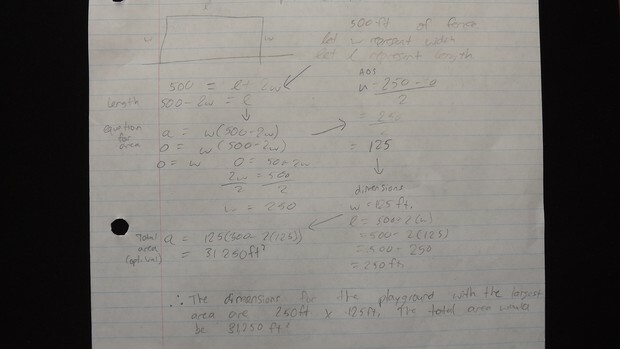 Quadratic word problems can be useful in real life, such as optimization problems. It could be useful to find a playground that will give the largest area, or the price of something that will bring in the most revenue. Many of these things can be used in real life jobs, including architecture, business, etc. This assessment was the mini-test 2. It included multiplying binomials, factoring, graphing, and a communication problem. 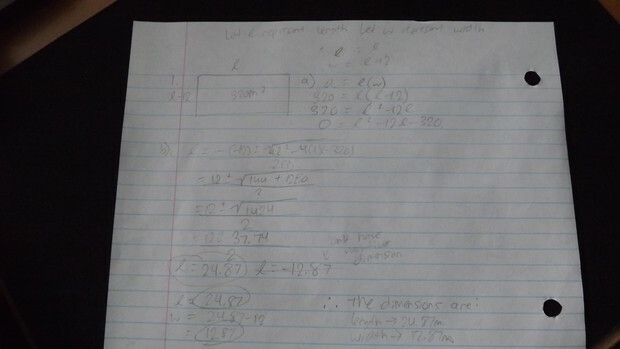 For the matching part, I was able to identify the types of equations and which methods would be used from practice. Number 6 was multiplying binomials. I multiplied the 2 binomials, then added like terms. Number 7 was factoring. 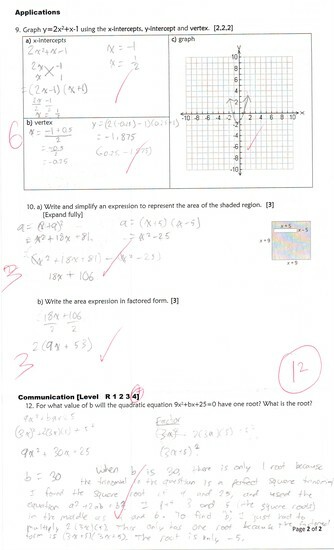 The first question was a complex trinomial. I found the factors by finding the factors of a and c, and making sure that when multiplied and added, they would add to b. Number 8 was factoring, and then solving for the roots. To do this, i factored each equation, then made it equal to 0. After this, I isolated the x's to find the 2 roots. In number 9, I once again used factoring to find the roots. 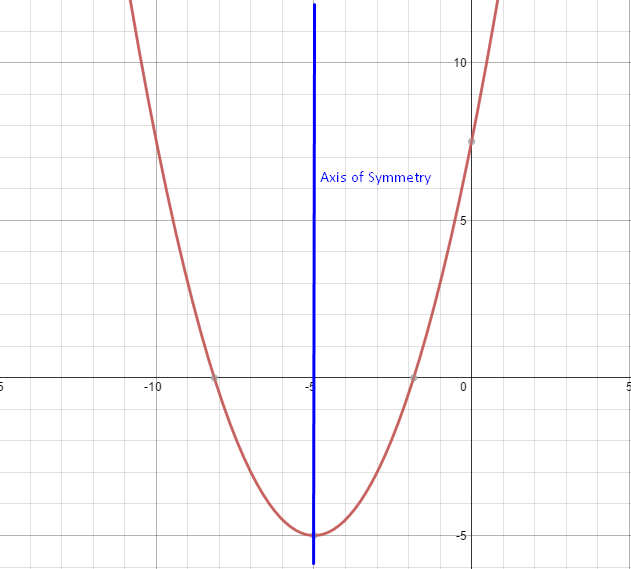 Once I had the roots, I found the axis of symmetry and the optimal value, which gave me the vertex. 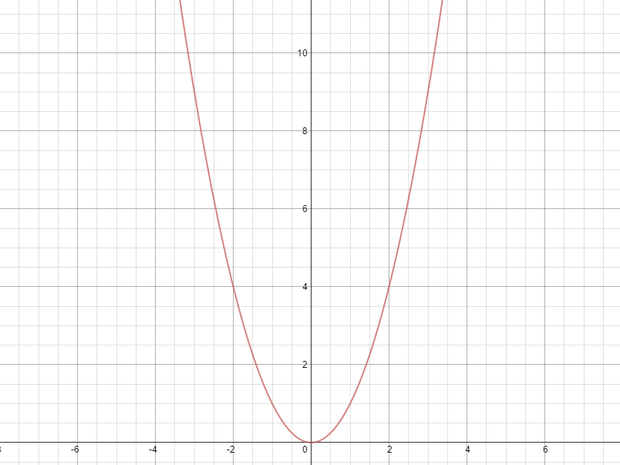 Finally, I graphed it by plotting the vertex and the roots. In number 10, I created an equation for each shape. 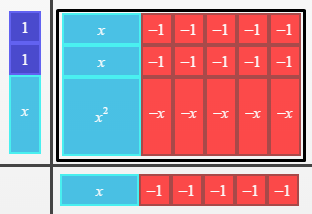 I made an equation to find the area of the square and an equation to find the area of the rectangle. I then subtracted the area of the rectangle from the area of the square, and added like terms. This gave me the area of the shaded region. 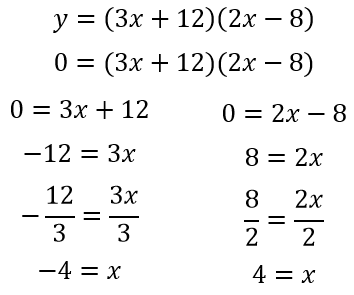 I then factored it in the next question using common factoring. 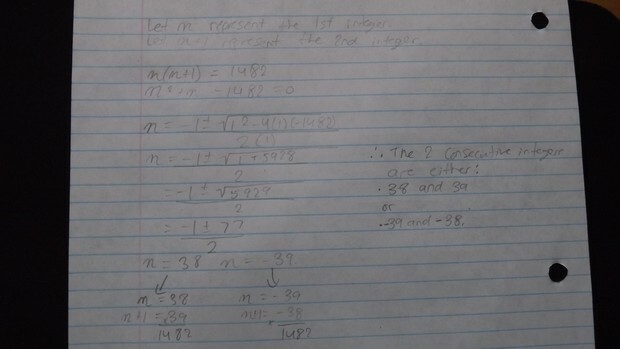 In number 11/12, I was able to find the answer that would give one root, which was 30. I got this because the trinomial in the question was a perfect square trinomial. When there is a perfect square trinomial, there is only 1 root, so I solved for the b of the equation. All in all, this assessment was good. I got a great mark, and I learned a lot from this part. 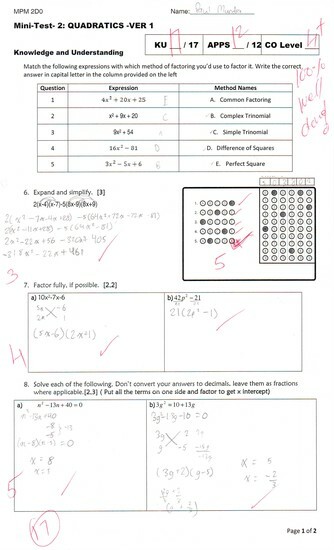 Factoring and multiplying binomials is an important concept to understand, and I'm proud that I did good on the test. In this topic, we'll analyze, graph and solve quadratic equations.